Located on the southwestern tip of the island is a very spacious lighthouse. 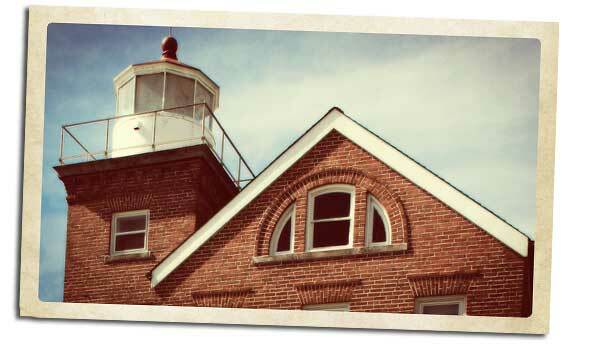 The brick lighthouse is a 2-1/2 story house with an attached 60' light tower. The US Lighthouse Board approved construction of a lighthouse on the island in 1893. Two years later the government purchased 2 acres at Parker’s Point from Mary and Alfred Parker for $1,000. The United States Engineering Department and J.P. Bumpus oversaw construction of the lighthouse. Instead of using the day's typical design of a large lighthouse with a small, detached keepers dwelling, they built the large home with an attached tower. Inspired by the Queen Anne style of the prior century, the home was built of red brick and boasted many modern conveniences. The lighthouse stood 60' tall when finished and with a fourth-order Fresnel lens. It was first lit on July 10, 1897 and was in continuous operation until 1962 when the U.S. Coast Guard built an automated light tower to replace it. In 1967 the Coast Guard turned the lighthouse over to the United States Department of Health, Education, and Welfare's Division of Surplus Property. L.S. Putnam, Director of The Ohio State University's Stone Laboratory, located on Gibraltar Island just offshore from Put-in-Bay, recognized the unique opportunity that this presented. South Bass Island was not only close to Stone Laboratory, but it also provided many research advantages. Putnam proposed that OSU's Board of Trustees apply for ownership. The Board agreed with Putnam, and in October 1967, OSU became guardian of the South Bass Island Lighthouse through a 30-year quitclaim deed. Less than a century after its construction, the lighthouse was placed on the National Register of Historic Places in 1990. Seven years later, OSU gained permanent ownership of the property when the original quitclaim deed expired. The Coast Guard, however, still maintains ownership of the skeletal light tower. Although the lighthouse grounds are not open to the public, it is visible while approaching the island by ferry or boat and the University does host an annual open house.